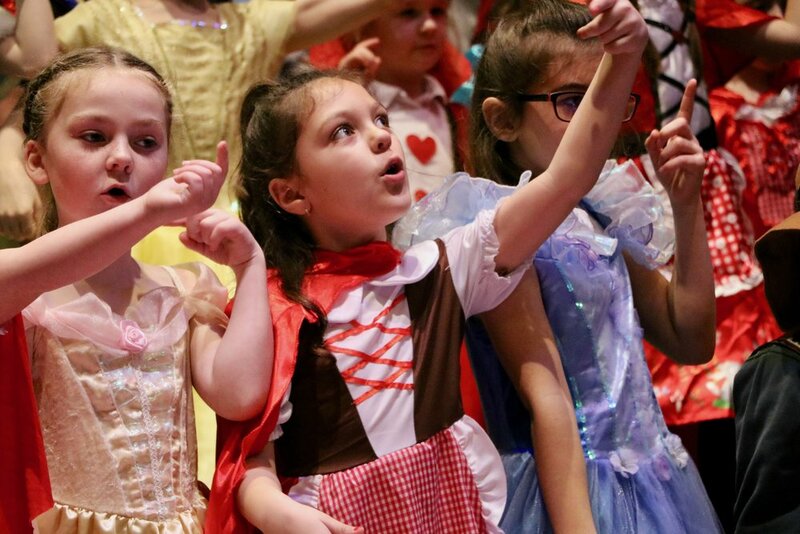 Hundreds of infant children dressed as fairy tale characters took to the Guildhall Stage at the Infant Voices Showcase on Wednesday 20 March. From Goldilocks and Puss in Boots, to the Big Bad Wolf and the Gingerbread Man, the children brought the characters and stories to life with their vibrant costumes and enthusiastic and expressive singing. The songs were composed by Portsmouth Music Hub's award-winning team of composers and the children delighted a packed Guildhall with their captivating performance. Children from fifteen schools across the city took part in the showcase which was the culmination of a city-wide singing festival involving over 1500 infant children. 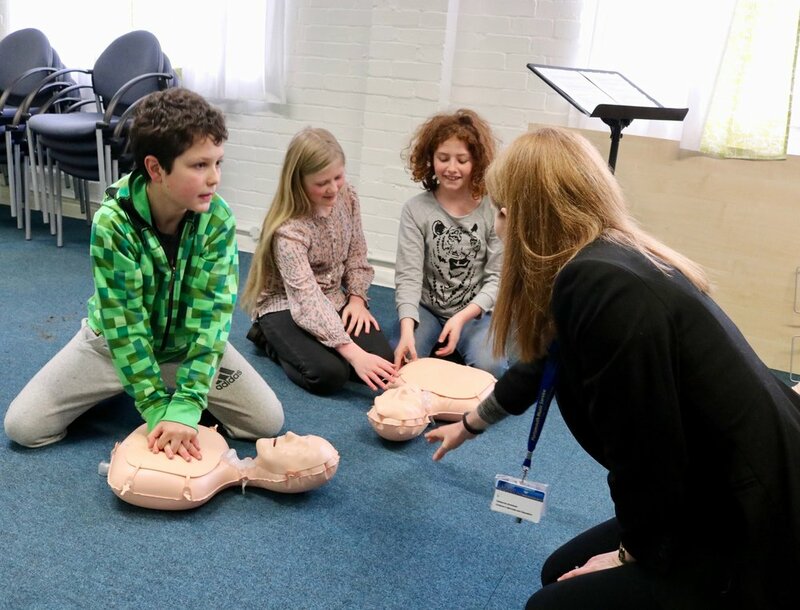 Sue Beckett, CEO of Portsmouth Music Hub and one of the show's conductors said, "Enabling young children to perform at such a prestigious venue as the Guildhall is an excellent opportunity for children to develop their self-confidence, self-esteem and performance skills through singing. Pre-show nerves were transformed into focused concentration and beaming smiles as soon as the show started." Children and young people came together on Wednesday (13 March) at Portsmouth's Guildhall for an evening of music, drama and dance. Soundsational was a celebration of musical talent in Portsmouth and it was an opportunity for the young performers to take to the stage in front of enthusiastic audience of friends, families and members of the public. In the company of the Deputy Lord Mayor of Portsmouth, Councillor David Fuller, schools and colleges from across the city performed a variety of familiar songs, stage hits and extracts from musicals. Elton John's Circle of Life, Too Darn Hot from Kiss Me Kate and songs from Fame were just some of the songs performed alongside music from the Kings of Leon, Nirvana and Foo Fighters. The stage was packed with rock bands, choirs, dance groups and the audience were delighted by the eclectic mix of music that left everyone wanting more. Councillor Suzy Horton, said after the show: "It's been an incredible night, with a wide range of captivating performances. The enthusiasm of so many young people is truly inspiring for everyone involved, and the audience responded so positively to the skill, the passion and the commitment of our talented, young performers. The creative future of Portsmouth is definitely in safe hands." The University of Portsmouth Concert Band gave a special performance for local school children at the New Theatre Royal on Wednesday 27 February. Over 400 children were treated to an afternoon of exciting live music with the band, conducted by Ken Wharton-Emms. A dramatic opening of 2001: A Space Odyssey led on to a wide variety of music, including such familiar favourites as medleys from Moana, Beauty and the Beast and Frozen, as well as music from the film How To Train Your Dragon, which was conducted by University student Martin Douglas. In addition, each section of the band performed individual pieces, giving children the opportunity to learn more about each instrument. Colin Jagger, Director of Music at the University of Portsmouth, said: "It was wonderful to see the University of Portsmouth Concert Band providing such a musical feast for so many young school children from across the city. The unique atmosphere of the New Theatre Royal contributed to a truly special occasion for all concerned." Giddy the Goat and hundreds of primary-aged children from across Portsmouth took part in Music in the Round's thrilling interactive concert following the trials and tribulations of a young mountain goat who is scared of heights. Based on the children's book by Jamie Rix and Lynne Chapman, and with music composed by Paul Rissmann, the concert tells the tale of facing fears and making friends. 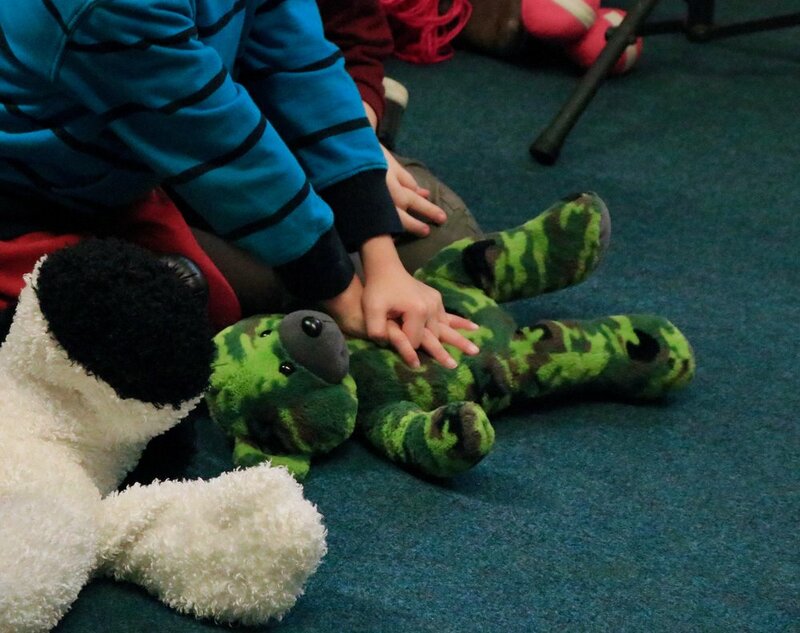 Featuring lots of audience participation and image projections from the story, this concert engages young audiences aged 3 to 7 years in top-quality music-making alongside professional classical musicians. The goal is to embed music in children’s everyday learning. 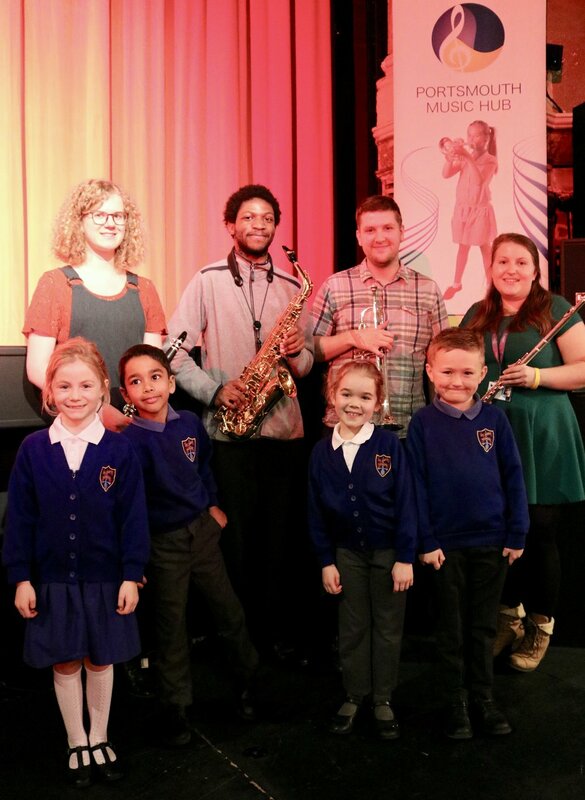 Sue Beckett, CEO of Portsmouth Music Hub, said: "Music in the Round is an incredibly popular event with children, and it's a fantastic example of partnerships working together to create a thrilling and inspiring creative experience. The Music Hub is responding to the cultural challenge, working with partners to develop a broad range of creative opportunities that are accessible to every child and young person in our city. The special concert performed by Ensemble 360 took place on Monday (28 January) at Portsmouth's Guildhall. 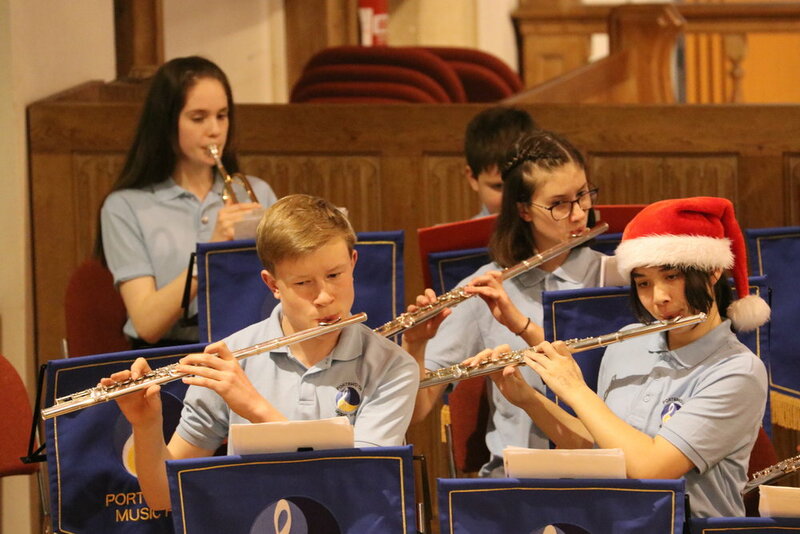 Children and young people were at the Church of the Resurrection on Monday (17 December) to celebrate the festive season and to mark the end of another year of music-making with Portsmouth Music Hub with a Christmas concert. Each week, during term-time, Portsmouth Music Hub offers children with a passion for singing and for playing a musical instrument the opportunity to receive expert guidance from the Hub's team of music teachers. The children and young people work together, developing musical skills, confidence and a passion for music in a secure and sociable environment. The young members of the Music Hub's many ensemble groups performed for a proud audience of family members. It was a night to celebrate young talent and with performances from the Hub's wind bands, the orchestra and choirs, and the audience enjoyed a festive programme of music including Holly Jolly Christmas, Sleigh Ride and the Theme from the Muppet Show; so, not quite a Christmas tune but close enough! Sue Beckett, CEO of Portsmouth Music Hub, said: "The Christmas concert has been a celebration of all the incredible work that the children and young people have undertaken throughout the past year. It's a chance for them to show their families the amazing progress that's been made, and to gain experience in performing live to a friendly audience. 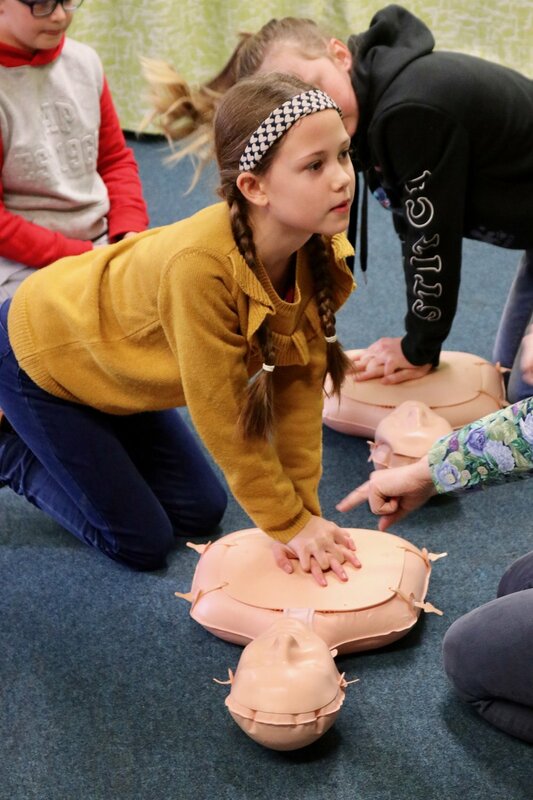 Our ensembles continue to make a real difference to the confidence and the abilities of the young people who work so hard and achieve so much." It's not every day that thousands of children get the chance to have Portsmouth Football Club all to themselves, but on Monday (10 December) children from across the city were at Fratton Park for a Christmas concert, which also included an unforgettable visit from Father Christmas himself! 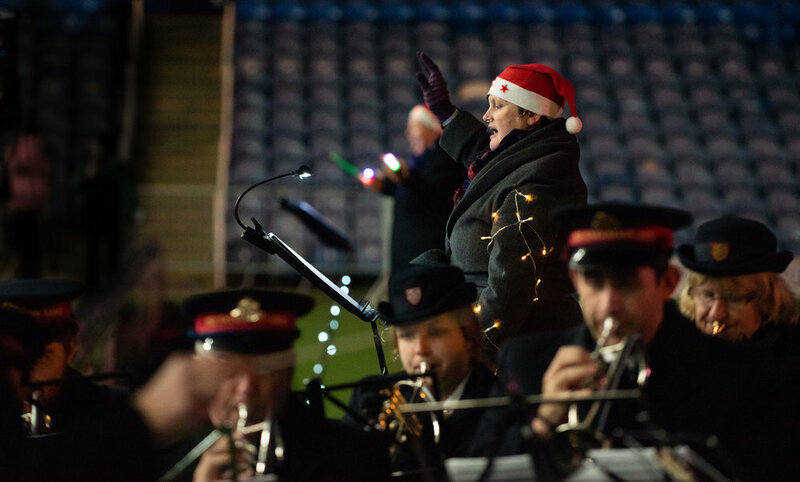 The primary-aged children were joined by their families in the stands, wrapped up well on a chilly night, and ready to join in the singing led by conductors from Portsmouth Music Hub and the Salvation Army Band. For one night only the familiar chants from supporters were replaced with the crowd singing a host of popular Christmas songs including Hark the Herald Angels Sing, Jingle Bells, Away in a Manger and Christmas Calypso. With a welcome from the Deputy Lord and Lady Mayoress of Portsmouth, festive poems from Howard Payne, Headteacher of Medina Primary School and Councillor Suzy Horton the children and their families enjoyed a joyous occasion, packed with yuletide sights, sounds and songs. A Christmas celebration wouldn't be the same without a big surprise, and as the Band played and the children sang a rousing rendition of Santa Claus is Coming to Town the famous man arrived to greet the cheering crowd. This was the highlight of the concert, with children clapping and high-fiving Santa Claus, who even gave the Deputy Lord Mayor of Portsmouth a yuletide hug. After the concert and as he was about to climb aboard his sledge to head back to the North Pole, Santa Claus said: "What a wonderful evening, with such delightful singing, and all the children behaved so well, so they are bound to get a present or two on Christmas Day. Now, I must fly home, I've got to speak to the elves and start wrapping the presents."